Right Click On The Images To Open Them In A Separate Window. Visible Satellite Image Of TS Nate At 4:15 PM MDT. 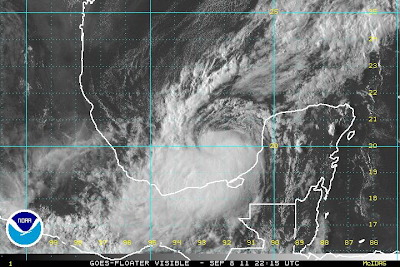 IR AVN Satellite Image Of TS Nate At 4:45 PM MDT. 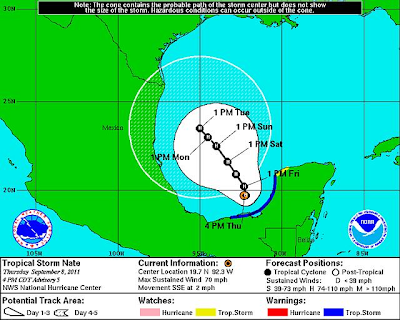 NHC Forecast Track Of TS Nate. At 6:00 PM MDT, Tropical Storm Nate was located 110 miles west of Campeche, Mexico. Nate was nearly stationary. He has sustained winds of 70 mph with higher gusts. Nate's central pressure is down to 994 millibars, or 29.35 inches of mercury. 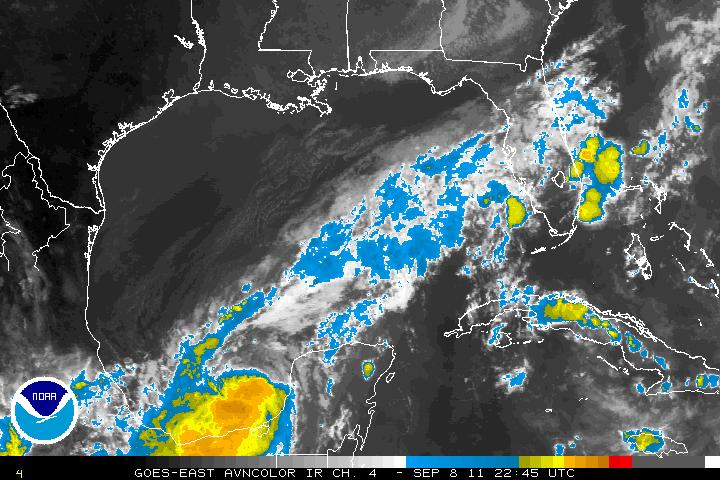 Tropical Storm Nate is on the verge of becoming a minimal Hurricane. Nate's forecast track continues to remain highly uncertain into early next week. Nate could move westward into Mexico, or he could move northward, and threaten the Texas Gulf Coastal areas next week. One thing is for sure however, and that is that he isn't going anywhere very fast anytime soon.